Unique setting over the port of Molyvos with 180 deg view of the sea plus a sunset right opposite the veranda. Top quality construction and interior decoration, equivalent to a private house rather than one to rent. High tech and energy efficient heating / cooling (for the environment conscious). Very friendly and cultivated owners with a history of many generations in Molyvos. This year was our third visit to Molyvos, each time living in accommodation provided by Athina and Stratis Krallis. We have previously stayed in ‘Molyvos Cottage’ just to the south of the town, but this year we spent two weeks in the new Heliades apartments overlooking the harbour. 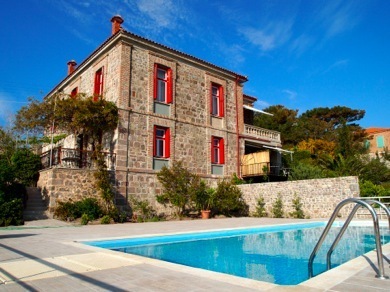 The Krallis family have done an excellent job in building a set of spacious, modern apartments within a manor house building that faithful to the local Greek architectural style, including the attractive Turkish influences. Our apartment was spacious, comfortable, tastefully furnished, comprehensively equipped and, thanks to an efficient heat-pumped temperature control system, cool. We enjoyed meals on the veranda watching boats in the harbour below, we swam from the beach below the town walls, we shopped at the local bakers and supermarkets, we had meals out in numerous good local restaurants, and we explored further afield on our faithful steed (a scooter from Moto George). We felt at home. We will be back. During the past decade I have enjoyed regular summer holidays in Molivos and as guests of the Krallis family. For this reason I was very interested – and curious – to see and experience the new apartments their son Yiannis has built next to the traditional family home. Rather charmingly they are each named after the daughters of the sun god and I stayed in “Phoebe” with friends, for 15 days in June/July 2014. The complex has been thoughtfully planned and built to blend with the traditional (and protected) village architecture. Phoebe has delightful traditional accents in its interior décor while at the same time providing comfort and a high level of amenities, all topped by a truly magnificent view from the terrace. As a designer myself, I was also curious to see inside the remaining apartments and Mrs. Nana Krallis, who has been responsible for the interior design, kindly showed them to me. Each of the three other two-bedroom townhouses features their own particular style, as does the single bedroom unit that completes the complex. They all have their own charming characteristics, and are not only imaginative and well thought out but also individual. This is certainly what today’s holidaymakers are looking for. The location, near the fishing port and a short walk to the village center is excellent and I would have no hesitation in recommending the Heliades complex to anyone considering a holiday in Molivos. I had the good fortune to stay in Heliades in June 2014. It was a real treat! The views just don’t stop. From every room you see the harbor and the sea and landscape beyond. Even the stormy days were lovely, watching the clouds shift over the sea. These apartments are newly built, but in the traditional style for which Molyvos is famous. Comfortable and amply spacious with the balconies, the units are elegant in design and decor and yet well-suited to indoor-outdoor summer living. Firm but comfy mattresses, hi-speed Wi-fi internet, a couch and satellite TV, a kitchen equipped with nice coffee maker and the best juicer I’ve ever used (for those amazing Greek oranges)… basically home away from home. So much better than staying in a hotel (and probably about the same price as two hotel rooms). The gorgeous barrierless showers have given me new inspiration for renovating my bathroom at home. And the location…! Very nearly directly across from the ruins of Roman baths, and really directly across from an Ottoman fountain. Walk a few steps down to the lively harbor. Walk a few more steps up to the castle. Walk horizontally (mostly) a few steps to access the heart of the village with lovely shops and cafes. A little “train” (new this year) will take tourists from the harbor to the village entry and beyond to Petra if so desired. Two couples could stay there comfortably (the twin beds in the second bedroom can be put together to form a double), or families with up to two children. 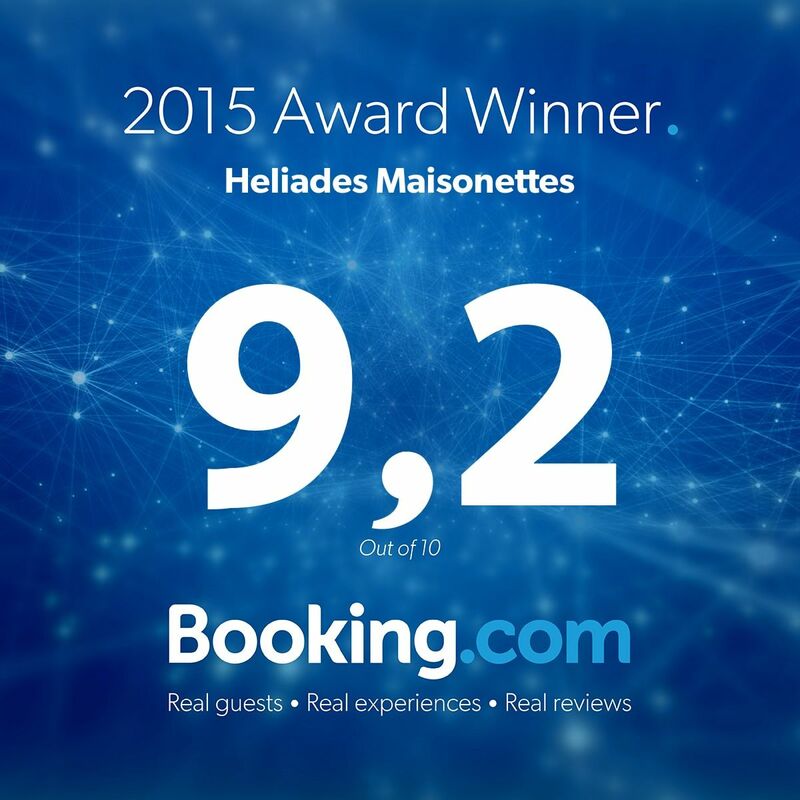 I would happily stay in Heliades again and highly recommend to couples and families.